On the night of January 31st, 2012, many people in Rio Grande City, TX were too scared to even step out of their houses for fear that they might get hit by a bullet. The Starr County Memorial Hospital could not give me any patient information, but they did confirm that some individuals (at least one) were treated at the hospital on New Year’s Eve for wounds caused by bullets falling and hitting people. These New Year’s Eve 2011 bullets were not from drug cartel guns though. These bullets were from residents of Rio Grande City, TX celebrating the New Year by foolishly shooting their guns into the air. I called the Rio Grande City Police Department and asked them about the celebratory fire that had occurred. The Detective I talked to was very polite and open to talking about the incident. He told me that this is something that happens all along the border, not just in Rio Grande City, and it has gone on since he was young. He said that what goes up must come down and that throughout the years there have been random damages from bullets going through roofs, etc. My brother, James Bellow, lives in this border town and he reported this information to me (he stayed living on the border after his Army National Guard Border Mission was complete). He was quite disturbed to be in an American city and have something so uncivilized and dangerous like this happen on such a widespread scale. On this same night, a boy in Florida was critically injured when a celebratory bullet shot through his scull as the boy watched fireworks. Gunfire could be heard all night in all corners of the city. The bullets were dropping everywhere and many people were too scared to even go outside. 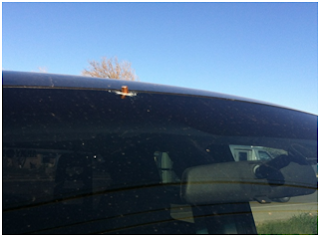 My brother said that one man had a bullet hit him in the back. He said that some had hit people’s roofs. My brother himself even received damage because he had a large .40 caliber bullet damage his truck (see pictures of truck below). My brother also used his cell phone video camera to capture audio of the constant sound of high caliber, rapid gunfire (see video below to hear gunfire). As I was scanning through the internet to see if I could find any other media reports of the injuries and damage caused by the New Year’s Eve celebratory fire in Rio Grande City, I came across a very interesting story involving a woman charged with murdering an illegal immigrant and attempted capital murder. Something seems very strange about this story and it seems as though the police are closing the case without even getting any evidence. The deceased illegal immigrant, Jose Antonio Solis Sanchez, was found dead under a tree in Rio Grande City, TX. It took 2 weeks before any leads came in about what happened. Finally, the police got a lead from the man who was driving Sanchez the night he was shot. According to the driver, Sanchez was in a van with the driver and 2 other men (all men were unrelated). The van somehow ended up in the yard of the alleged murderer, Lizbeth Hinojosa Garcia. The driver says that Garcia came out yelling and shot 2 times at the van. 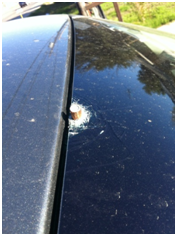 One of the bullets struck Sanchez (Garcia and Sanchez are unrelated). The police have admitted that they do not know why the van and those men were on her private property. They police admit that they do not know what happened to the van or where it is located. The police admit they do not know how the man ended up dead over half a mile away from where he was shot. The police do not even know what the motive was for the shooting. The Rio Grande Police are positive that this was a cold blooded murder and NOT self-defense. REALLY? How can you rule out self-defense or manslaughter if you do not even know the details of what happened that night? You don’t think a 28 year old mother of 2 children might possibly have feared for her life because there were 4 unknown men on her property in the middle of the night? The area is known for drugs and cartel violence after all. If you believe the driver, the woman was yelling and shot twice. She did not riddle the van with bullets trying to kill everyone in the van. Maybe she was yelling to get off of her property and then one of the men in the van did something to startle her so she reacted by pulling the trigger twice? She might not even know that she has shot anyone if the van drove off after she shot at it. Maybe she thought she saw something in the van like a gun? I am not necessarily defending this woman. This woman very well might have committed cold blooded murder by leaving her house to intentionally kill an innocent person in a van on her yard, but this woman might likely have also feared for her life and is simply guilty of manslaughter or not guilty at all due to self-defense. WE JUST DON’T KNOW. The police have no evidence. Can the police really fully believe what the occupants of the van say? These men did not call police for weeks, have no explanation of why they were in the woman’s yard, do not know where the van is, and they did not even call for an ambulance and do not know how the man ended up dead half a mile away from where he was shot. It all sounds very strange if you ask me. I think there is more to this story. I also think that the Rio Grande Police have jumped to conclusions by ruling out self-defense and calling this cold blooded murder before they have any evidence. Just last year, in a different part of Texas, the Hardin County District Attorney charged Clint West with the murder of Nicole Janca. West had previously only been charged by the Hardin County Sheriff’s Department with providing alcohol to a minor. This is an example of a case getting closed before all the evidence was looked at. Thankfully the Hardin County case was reopened and more evidence was examined which resulted in the murder charge. The Starr County District Attorney and the Rio Grande City Police Department need to step back and get the evidence first before they close the case or make any final determinations. They especially cannot rule out the possibility of self-defense yet. They should especially not close the case before they even know what happened. Something just seems fishy about this murder charge in Rio Grande City and I sure am interested to see how the case moves forward and what new evidence will come out.